"It was such a relief to have Rose help me go through my closet. I couldn't get rid of stuff - even though I know I needed to. She helped me pull outfits together with things I had that I would have never thought about! Thanks Rose!" - Stacy S.
Adding some artistic flare to this talented lady. A little polish makes a huge difference to attitude! "What a pleasure it was to work with Rose! She helped me understand how to better dress my body type with different fits and patterns and opened my eyes to a lot more possibilities! I can't wait to go shopping with all of this new information!" - Nicole D.
"When I found out I had a major career change coming up, I knew I just had to have Rose come to my closet and help me dial in a new professional look. She came in, got to know me, my likes, my personality, and what I want to convey through fashion. In just three hours I went from thinking I needed a complete new office wardrobe to seeing I have so many staples, and a shopping list (plus money saving tips) to fill in the gaps. I'm so excited to take everything Rose taught me and walk confidently into my new office. Thank you Rose, I couldn't be happier that I decided to invest in the closet session!!" - Kelly Jo A. From leggings to LEGS FOR DAYS! "Rose was a birthday gift to my best friend living in another state. While I was nervous who would show up to my friend's door, I am 100% satisfied with the results. I FaceTimed with my friend after and she gushed about how professional and fun Rose was to work with. My friend is a stay-at-home mom to her 2 yr old and she was trying to get back to the working world. Rose , also a mom, was kind where she needed to and was sweet as she got real with my friend. Well worth every dollar!" "I had an amazing experience with Rose! She is the best! Whatever you do please schedule a consult or sign up for her Style Class! Heck, do both! You won't be sorry. I have walked away with so much knowledge from her expertise. You will feel like a new person!" - Mary C.
"Rose is such a talented stylist. 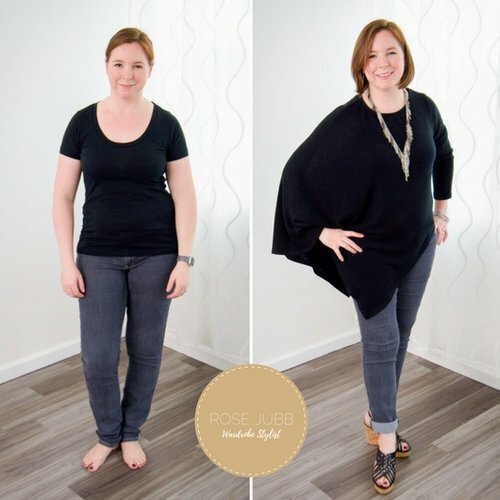 She is able to pinpoint and find solutions to body, style, and budget issues. (And she's got a fun sense of humor to make everything a positive and safe experience!) Love her!" - Emmy B.
I want results like this! "Rose has such great tips & tricks when it comes to style! Watching her videos has made me think more about how I present myself, and know that I'm worth the time and effort!" - Katie B. "I met with Rose today for a consultation and she was fabulous! I left with a plan and list of items I should look for to add to my closet that would best suit my lifestyle, personality, budget and body. I'm so fashion illiterate, but she made me feel comfortable, was encouraging and I highly recommend her if you need a little help in that department too." - Jody M.
"Thank you for the amazing experience today! Music, pictures, and a shopping list that takes the guesswork out of it for me! It really was an experience to be treasured. Not to mention the person pulling it all together -- you!" Want to know when my Style Class™ goodies will dropping? Or just want to get walked through all my freebies? We respect your privacy, babes. Duh! I fun senior photoshoot styled by your's truly. "Rose is ahhhhhh-mazing. She purchased some clothing options for a recent conference I was speaking at. I loved everything she brought over. At the conference I was CONSTANTLY complimented on how well I looked. I also felt confident because I knew I was polished. She went above and beyond and will be shopping for me again. She actually made clothes fun. I didn't have to go store-to-store .... everything I tried on was my size and my style. She also busted a myth about the type of jeans (boot cut) that I have been wearing my entire life. She provided a different option (straight leg) and she was RIGHT they are much better for my body type. She is knowledgeable. She is stylish. She is kind. She over-delivers. I can't recommend her and her services enough." - Lindsey A. "I grew up a tomboy, and I've never really acquired a style, other than comfort. Rose came to my home and helped me put together styles that fit me and accent my accents. ;) She helped me see what was right for my body type and how to dress it properly, with layers and such. She helped push me out of my comfort zone. Now I think what would Rose say. She had a lot of great information and really started getting me to think about style and what works and what doesn't and organize my closet in the best possible way. She is an amazing person, so sweet, gentle and fun to work with. I highly recommend hiring her!" - Megan W.
The ease of a simple capsule. Oh yeah, baby! "She helped me get my fashion groove back this year and I can't tell you how much it's helped me. Love getting new ideas from Rose! She has an eye for style and offers a new perspective on how to make your current wardrobe feel updated. I've been inspired by her take on outfit ideas and putting in a little extra effort everyday to make myself feel more confident. Not only will she help you with your wardrobe, but she'll teach you how to best dress your body type. All in all - she'll help you learn how getting dressed can shape your attitude, mood and self-confidence. Love working with her! I feel more beautiful, professional and ready to slay the day now that I have fresh ideas and tips about styling myself everyday." - Jamie B.
I love taking items clients already have and mixing them with new items and wishlist items for the perfect idea boards. "Rose has always been able to turn me into a well dressed woman (instead of scrubs or leggings)! With her experience, I felt comfortable exploring different outfits and stepping out of my comfort zone." "Admittedly, I've always had a hard time trying to figure out what to wear. Immediately after our session, I made a quick stop at my local thrift store and had a bonanza shopping spree. I tried on 10 things and bought 8! That has never happened before. It was amazing how easy it was to find stuff after narrowing it down to a few specific colors and pieces that I was looking for. It was nothing short of magical. Thanks for your time Rose, I feel like I have already learned so much! Thank you, thank you, thank you!" - Kevi K.